All horses should have the right to feel safe during training. Traditional and natural horsemanship both primarily uses negative reinforcement to motivate behaviours. Negative reinforcement (often marketed under the euphemism of pressure/release) plays on the horse fundamental need for safety by first introducing an unpleasant stimuli and then removing it when the horse has completed the goal behaviour. Many trainers believe that because safety is the most important need of the horse then it’s the most appropriate way to motivate a horse to perform desired behaviours. 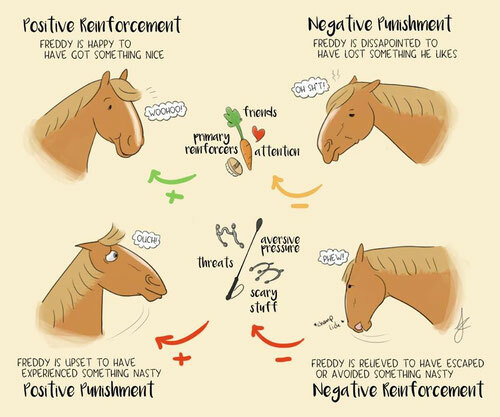 Drawing by Fed up Fred: illustrating the different quadrants of operant conditioning including negative reinforcement. My belief is that because we exclusively use horses for recreational purposes, not to cure cancer or solve world hunger (even if some riders act like they do), we shouldn’t be so comfortable in routinely, and primarily using negative reinforcement. Horses should have the right to feel safe during training; their performances should not be motivated by fear, discomfort and/or pain. 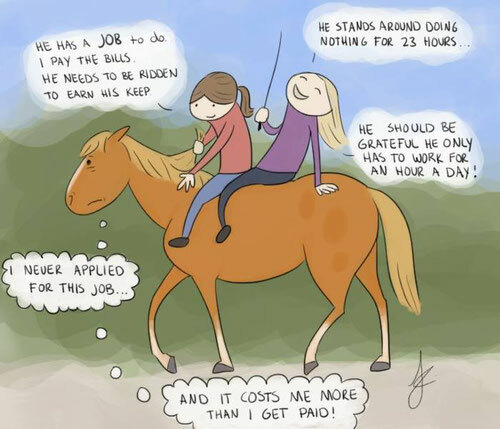 Many horse owners feel entitled to use aversive training methods; after all they spent money in buying horses and pay for their care, right? But domestication is far form being an ideal situation for horses, they have lost far more than they have gain; they have been subjected to internal biological changes and have developed aberrant behaviours. They are routinely subjected to stressful, painful stimulus and most often are managed in ways that do not meet their key needs. As horse owners it is our responsibility to help horses cope with domestication. Showing compassion in training is part of this. Drawing by Fed up Fred. The alternative is to use a training based on positive reinforcement. In positive reinforcement, something pleasurable is added to increase the frequency of the behaviour. To obtain the behaviour (and then be able to reinforce it) there are several options that do not involve aversive stimulation, such as: capturing, shaping, targeting, luring, moulding and mimicry. When training horses with positive reinforcement we mostly use food rewards (ingestion being the 2nd most important need of the horse) and scratches (body care being the 3rd need). Lunging: in this video the horse's behaviour is exclusively motivated by scratching. The behaviour was taught using a mix of shaping and targeting. Moving hindquarters: In this video the horse moves his hindquarters using targeting. Walk at liberty: This behaviour is the result of a training based on positive reinforcement. Positive reinforcement enhance horse/human relationship causing the horse to want to remain with his trainer. Dealing with a fear of stables: In this video I am reeducation a rescue pony to stables. Due to past trauma this pony would refuse to go near a stable and would panic (till injury occurs) when stabled. The training involved the use of counter-conditioning and systematic desensitisation. Preparing a horse for dental work: In this video the same rescue pony is being prepared for a dentist visit using targeting and shaping.